Treatment and management of teeth with furcation involvement is one of the most challenging problems confronting general dentist. In advanced furcation involvement, the tunnel preparation procedure is preferable to extraction when other treatments are precluded for financial or other reasons. 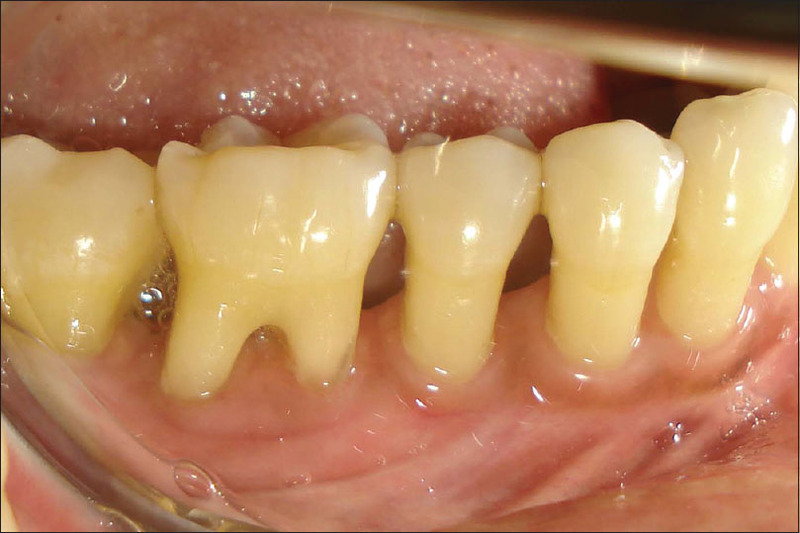 Certain technical problems, such as gaining access for oral hygiene procedures on posterior molars, are obvious; this heroic technique could not be considered as a regular treatment modality for any tooth or any patient. This treatment was done for a 38-year-old female patient in good general health. After raising a full thickness flap on the mandibular left side of the mouth, the furcation of tooth #36 was widened by a #2 round bur and bone file. Osteoplasty continued by bur, file, and chisel until enough space was created for interdental brush use to control dental plaque. Flap was placed apically and sutured. Prosthodontic treatment was done 4 months after the periodontal therapy. After 1-year, the treated tooth is still functioning in the mouth of the patient. We are satisfied with the result of treatment. Commonly, this type of the resective therapy can be offered at mandibular molars, which have a short root trunk, a wide separation angle, and long divergence between the mesial and distal root. Tunnel can be prepared on a maxillary molar also (mesio-buccal and disto-buccal). A 38-year-old female patient reported with the complaint of pain of left mandibular first molar with a recurrent swelling. 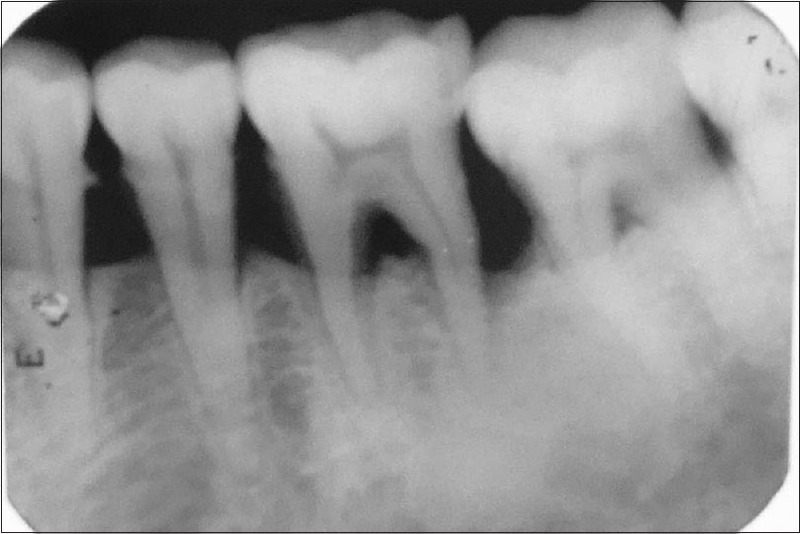 On examination, there was chronic periodontal abscess on the lingual side with #36 and it was sensitive to percussion. 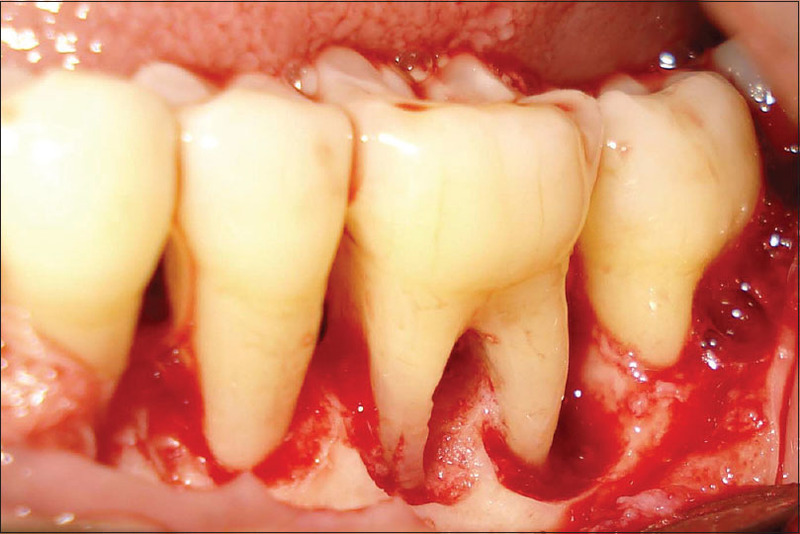 On probing the area, there was a 7-mm-deep periodontal pocket around the furcation area [Figure 1] and [Figure 2]. On radiographic examination, severe bone loss was evident in tooth #36 with grade III furcation involvement. The bony support on mesial and distal side of #36 was relatively intact. No periapical lesion was investigated around each root [Figure 3]. 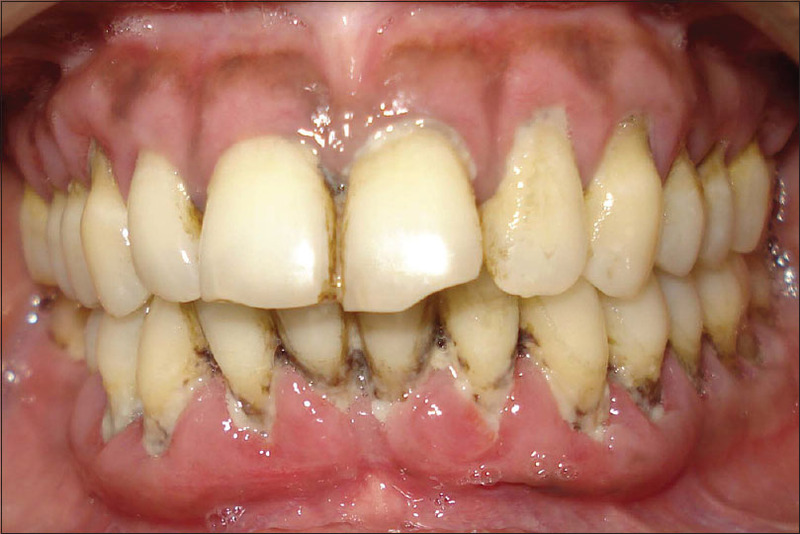 Phase I periodontal therapy completed and patient re-evaluated after 4 weeks and scheduled for surgery [Figure 4]. Under local anesthesia, periodontal surgery was performed. On intra-operative examination, severe bone loss and grade III furcation involvement was evident with tooth #36 [Figure 5]. During the surgical procedure, following the reflection of buccal and lingual flaps, the granulation tissue in the defect was removed and the root surfaces were scaled and planed, the furcation area was widened by round burs at the entrance and then by bone files to create space for postsurgical interradicular plaque control [Figure 6]. The mucoperiosteal flaps were apically positioned and sutured [Figure 7]. 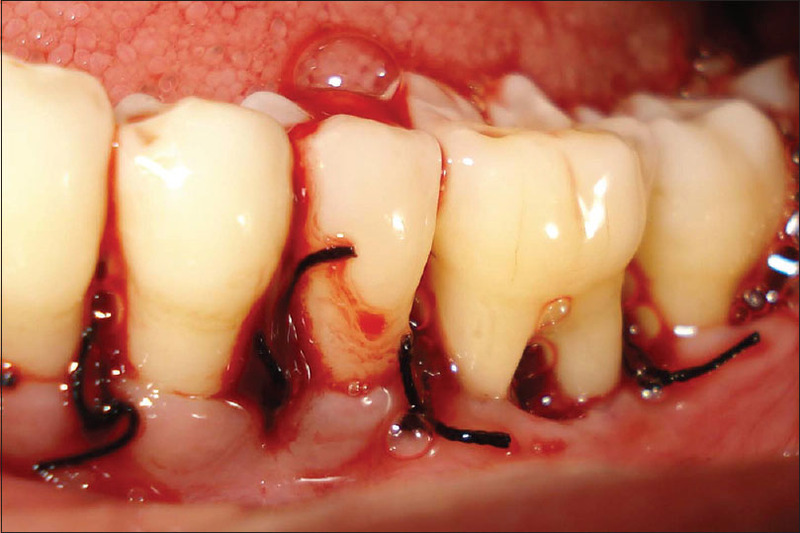 After the removal of the dressing, the patient was taught to maintain the tunnel area plaque-free with interdental brushes [Figure 8]. The majority of the patients followed a postsurgical schedule, which included rinsing with a 0.12% chlorhexidine digluconate solution for 4-6 weeks. Daily rinses with 0.025% sodium fluoride solution and the use of a fluoride dentifrice applied directly by the "interradicular" brushes was also recommended, while such treated areas are more prone for caries. Patient followed regular 3-6 months maintenance visits for a period of 1-year. At this time, the patient returned to her referring dentist for continued follow-up. The ultimate goal of treatment for teeth with advanced furcation involvement is to eliminate the furcation, which is main plaque retentive area in multirooted teeth and makes them more difficult to clean by the patient with mechanical plaque control measures. Alternative approach to treating an advanced Class II and Class III furcation involvement of especially a mandibular molar is called "tunnel preparation." The clinician widened the furcation area by round burs at the entrance and then by bone files to create space for postsurgical interradicular plaque control with the help of interdental aids in the form of the interdental brush. Length and curvature of roots-long and straight roots are more favorable for tunnel preparation than short, conical roots. Initially the prognosis of this treatment modality was considered questionable, but the results from the studies in previous years demonstrated that tunnel preparation procedures for treatment of Class III furcations have a significantly better prognosis than reported earlier by Hamp et al. Hamp et al. 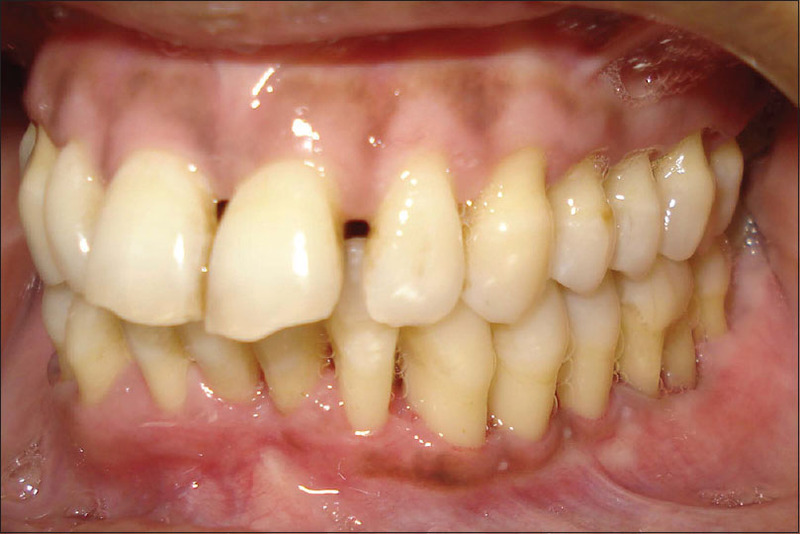 reported caries development in four out of seven "tunnels" during a 5 years "follow-up" period. This corresponds to a failure rate of about 60%. The results from the study by Hellden et al.,  which were based on 156 treated teeth, showed that approximately 75% of the reexamined teeth were caries free and in function at the time for the "follow-up" examination. Root resections and tooth hemisections are usually associated with time consuming and expensive endodontic and prosthodontic treatments. The major advantage of tunnel preparation is that, in general, it does not require subsequent endodontics or fixed prosthetics. Also on teeth with reduced bone support, this treatment will not lead to significantly increased mobility such as is commonly observed after resection of one or more roots. It should be pointed out that a tunnel preparation procedure does not exclude the possibility for later hemisection or root resection if this is indicated. Tooth extraction is the ultimate or last and radical treatment modality in periodontally compromised teeth. The tunnel preparation procedure is preferable to extraction when other treatments are precluded for financial or other reasons. Certain technical problems, such as gaining access for oral hygiene procedures on posterior molars, are obvious. This commonly necessitated a relatively radical widening of the furcation. Secondary healing and interradicular placement of surgical dressing during the initial healing period, followed by early initiation of cleaning with interdental brushes, were useful means to solve such access difficulties. Newell DH. Current status of the management of teeth with furcation invasions. J Periodontol 1981;52:559-68. Leonard HJ. Indications for the removal of teeth from the standpoint of oral diagnosis and periodontia. Dent Cosm 1931;73:390. Saxe SR, Carman DK. Removal or retention of molar teeth: The problem of the furcation. Dent Clin North Am 1969;13:783-90. Prichard JF. 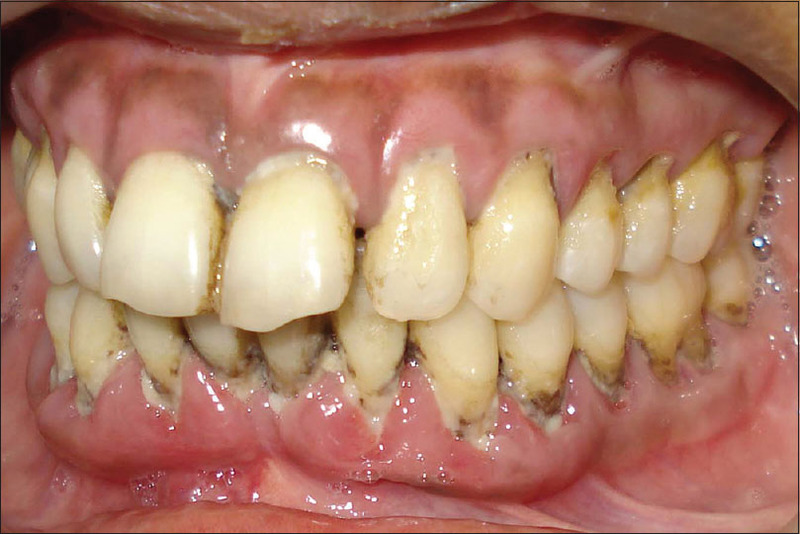 The Diagnosis and Treatment of Periodontal Disease. Philadelphia: W. B. Saunders Co.; 1979. p. 161-2. Hamp SE, Nyman S, Lindhe J. Periodontal treatment of multirooted teeth. Results after 5 years. J Clin Periodontol 1975;2:126-35. Ross IF, Thompson RH Jr. A long term study of root retention in the treatment of maxillary molars with furcation involvement. J Periodontol 1978;49:238-44. Ross IF, Thompson RH Jr. Furcation involvement in maxillary and mandibular molars. J Periodontol 1980;51:450-4. Nyman S, Rosling B, Lindhe J. 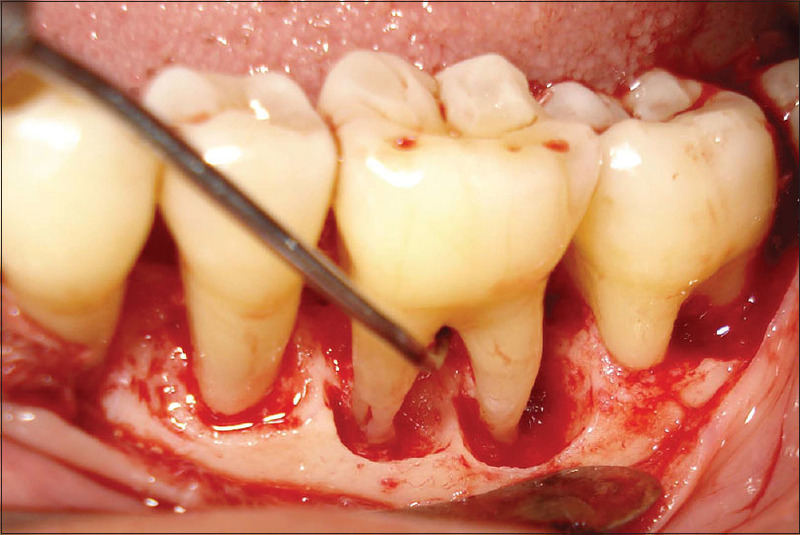 Effect of professional tooth cleaning on healing after periodontal surgery. J Clin Periodontol 1975;2:80-6. Langer B, Stein SD, Wagenberg B. An evaluation of root resections. A ten-year study. J Periodontol 1981;52:719-22. Hellden LB, Elliot A, Steffensen B, Steffensen JE. The prognosis of tunnel preparations in treatment of class III furcations. A follow-up study. J Periodontol 1989;60:182-7.